“And the ark of God remained with the household of Obed-edom in his house three months. And the LORD blessed the household of Obed-edom and all that he had.” (1 Chronicles 13:14). Admittedly, we don’t know a lot about Obed-edom. He’s only mentioned a few times in the Bible. Have you ever really thought about that passage? What did those blessings look like? Exactly how did God bless him? In this story you’ll see what those blessings might have looked like … and what it means for you today. 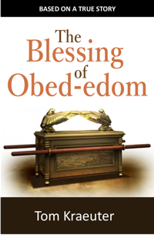 The Blessing of Obed-edom is available in paperback, or for Kindle exclusively from Amazon.